Dean’s shirts are hard to tell apart. This Beige dress shirt can look darker or lighter, depending on how much of the colour spectrum the show decides to give us. It sometimes even looks grey. This shirt has two breast pockets, but only the right breast pocket has a flap. 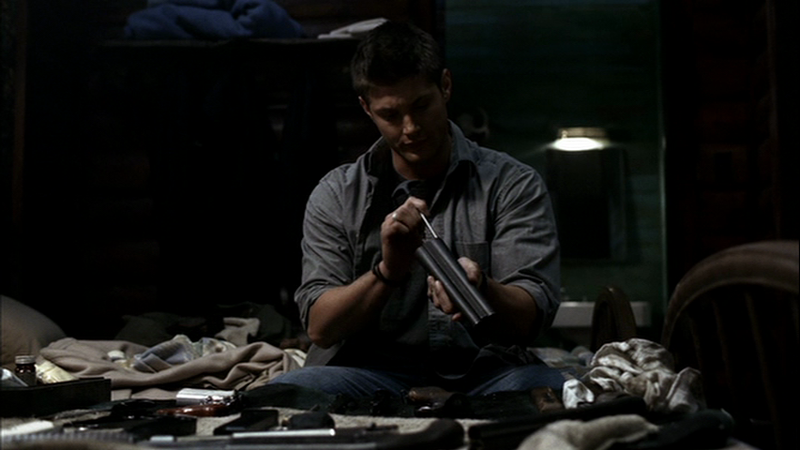 Like many of Dean’s shirts, it has a little brown label on the left breast pocket. It also has a black/blue strip inside the collar. In Scarecrow (1x11), Dean is wearing a brownish shirt with slightly raised stripes and what could be at least a left breast pocket. It is hard to tell if this is his Green Shirt or his Tan Shirt, or another shirt altogether. He wears it when Sam leaves, and when he first investigates the town and orchard. He changes out of it after he is run out of town. 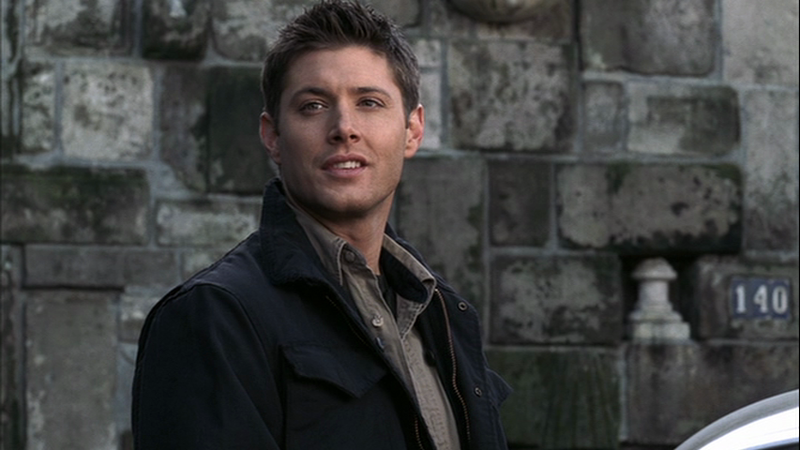 In Faith (1x12), Dean wears it when he says goodbye to Layla at the end of the episode. In Nightmare (1x14), he wears it from arrival in Michigan up until either their failed attempt to rescue Roger Miller, or for the entire episode except the final scene. 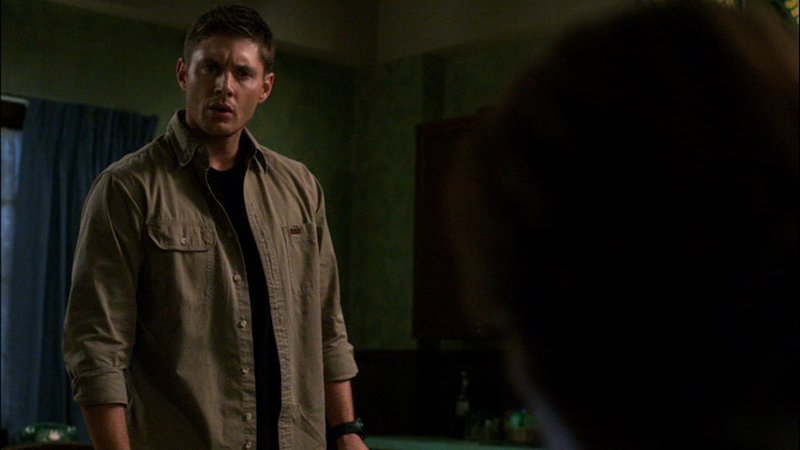 In Hell House (1x17), Dean wears it to the Hell House after the “second” murder (which is actually the first) until the end of the episode. 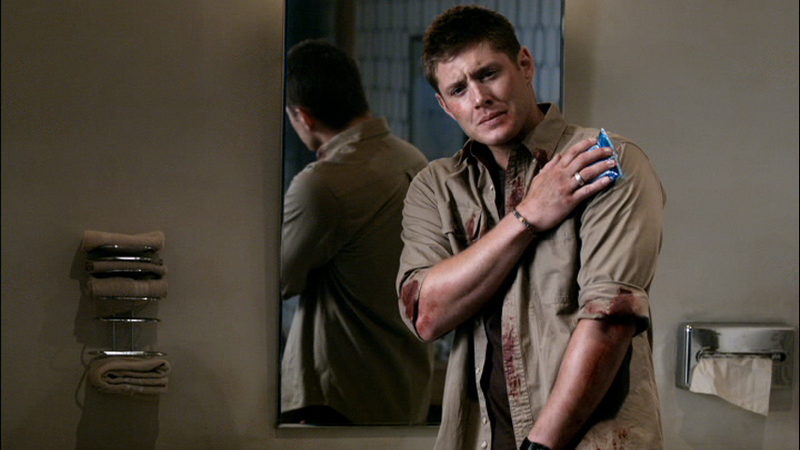 In Provenance (1x19), Dean is wearing it when they say goodbye to Sarah at the end of the episode. In I Know What You Did Last Summer (4x09), Dean wears it to go find Anna at the church, and while talking to Sam afterwards at the motel. He changes out of it before they head to the cabin to meet up with Ruby and Anna. In Clap Hands If You Believe (6x09), a whole two seasons after we last saw it, this shirt appears again. Dean wears it the day after his abduction, through his fight with tinkerbell, and until Sam banishes the fairies (and presumably until Dean gets out of prison). In We Need to Talk about Kevin (8x01), Dean wears this shirt from when they finally track down Kevin until the end of the episode. In Southern Comfort (8x06), Dean wears this shirt at the beginning of the episode when he and Sam are having a snack and Dean finds the job, and in the middle of the episode when he is researching with Garth in the motel room and going to the graveyard to find and then torch the remains of their suspected spectre. In Everybody Hates Hitler (8x13), Dean wears this shirt at the beginning of the episode when he and Sam first enter the Men of Letters Bunker. In Rock and a Hard Place (9x08), Dean wears this shirt at the beginning of the episode when he finds Sam asleep in the kitchen. In Sharp Teeth (9x12), Dean wears this shirt from the beginning of the episode until Garth invites him to the prayer group. LOL Carhartt is a sturdy brand of workshirt, and you can usually get them at any Bomgaars store.